There are several ways in which a bat can become a nuisance and require bat removal in a person's home, business, building or church. One of the more common ways that someone figures out that they have a bat problem is they have a individual bat flying around the living space of their home. This is the most common call that animal removal agents receive regarding bats. This is the first indication that there could be a bat infestation in a particular building. The bats that are usually found flying around the living area are typically juvenile bats that have somehow lost their way. When this happens a full and complete bat inspection should be performed by a professional bat removal company. Another service that is often performed is Bat guano cleanup. One of the first things people notice when they have bats is a rustling noise in their walls or ceiling. Once a bat makes its way into the house or leaves a disgusting mess in the attic, they've usually had enough and call us for bat removal. For more information on Bats Please Click Here. What damage will Bats do? Spread of Disease Bats, like other animals, can carry rabies. And although bats rarely bite humans, the risk of bat bites frightens us away from areas inhabited by bats. 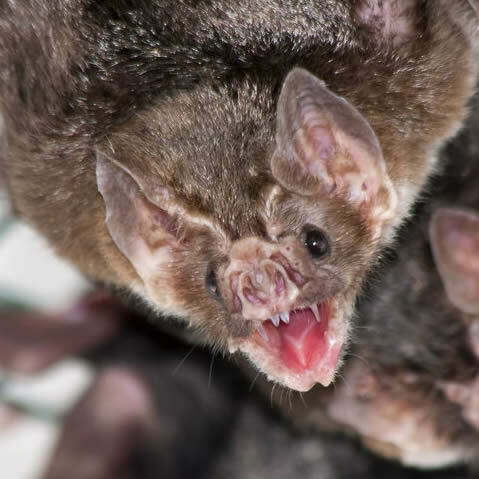 Along with the risk of rabies, bat guano carries the spores for Histoplasmosis, a disease mainly affecting the lungs of people, especially those with immunity disorders, the elderly, and the very young. Bat Mites Bat mites, often mistaken for bed bugs, will often make humans their new hosts. Insect exterminators, sometimes mistaking these for bed bugs, will treat a building, only to be called back time and again because the bugs were killed, but with the presence of bats, new ones took their place and the infestation began anew. Structural Damage Structural Damage. As we noted above, bats do not chew on buildings. However, their guano and urine will accumulate over time, resulting in waste dripping through ceilings, ruining insulation, and soaking through sheet rock or particle board, eventually causing the interior of the structure to collapse. How do we remove bats? Most customers love bats in the yard, but don't want them in their homes. A half inch of space or more is all a bat colony needs to get into the attic of your home or business. Bats feel most safe when they have to squeeze into their home, since they know most of their predators can't follow behind. Our removal services consist of sealing all potential areas around the home and installing bat valves which allow the bats out, but not back in. We seal all areas on the home including vents, vent fans, ridge venting, gable vents, and more. The bat valve is a one way door that allows the bats to fly out, but will not allow bats back into the home. Bats cannot enter your home in the same fashion a raccoon or a squirrel might by chewing threw a piece of rotted fascia. Bats can only enter through existing holes or man made holes. What health risks do bats pose? Rabies Rabies is transmitted when an infected bat bites or scratches a person's skin. Studies have shown that most bats do not carry the rabies virus, but unfortunately you can't tell by just looking at the bat.